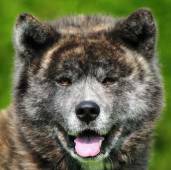 Since 1994 we have been breeding Akitas. 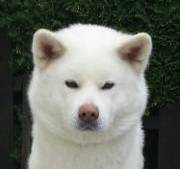 The Akita ist the tallest of the Japanese Spitz breeds. 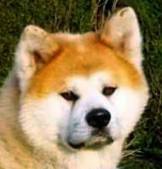 The breed comes from the North of Japan. More than 20 litters were born in our kennel. 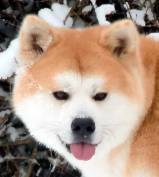 The kennel name „Amayadori ken" is Japanese and means „Shelter from the rain". thanks to being brought up in our home will be able to cope with every family situation, to become a lifelong faithful companion. 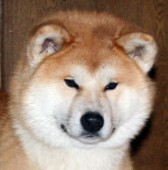 Puppies: We had one male puppy from Jissai No and Tenjou Homare Go Miyagi Watanabe Kensha on 19 July 2011. 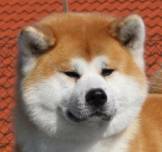 Please read the News of Amayadori Ken. Look at the Puppies pictures of the offspring of our kennel. We look forward to receiving a nice entry in our guestbook. 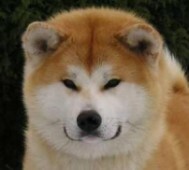 Akita and I (Akita und ich) describes my life with my Akita. Inform yourself about our breedings (Verpaarungen). We introduce our males (Rüden) and females (Hündinnen) including pedigrees (Ahnentafeln). 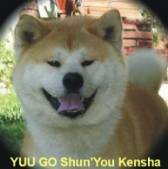 Please visit our kennel (Zuchtanlage). 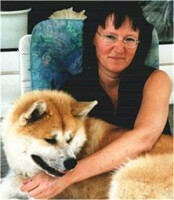 In December 2000 I visited a major Japanese dog show during my trip to Japan (Japanreise). Education (Erziehung): an important topic! This & That (Dies & Das): our collection of interesting, contemplative and odd pictures. In memoriam (In memoriam) reminds of our deceased dogs. Links (Links) gives you information about my other websites. Updates Änderungen lists the latest changes in our website.